A logged-in user has access to their own Settings page where various options can be configured. 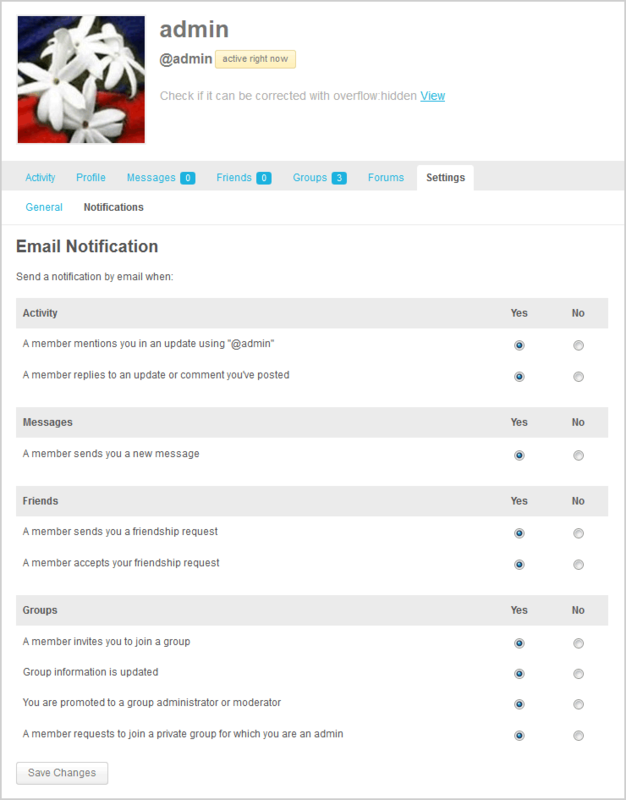 This can be accessed by hovering over the WP Adminbar in the top-right hand corner and clicking on the “Settings” link. Notifications – Each event listed below will trigger notification alerts in the site (bubble in WP Toolbar) and by email by default. You have the option of disabling email notifications for any or all of the events listed. Member Settiings > Notifications. Click on image to enlarge. Warning: Deleting your account will delete all of the content you have created. It will be completely irrecoverable. Checkbox: I understand the consequences. Other plugins can also add their own Settings subpages if they registered one.